There isn't enough human emotion in me right now to properly understand what The Summer that Melted Everything did to me. I feel like my innards are lying on the floor of the room I turned the last page in. I feel like I've been enveloped in a darkness so immense and all-consuming that I'd trade food for light, air for even a sliver of brightness. This novel holds you under water until you feel like your lungs might burst. I want to keep giving you metaphors, because I'm honestly not sure I can give you a proper review. "Particularly that June day in 1984, when the sky seemed to be made on the kitchen counter, the clouds scattering like spilled flour." The sweltering Ohio town is a small one named Breathed (pronounced "breath-ed"), and little does it know, the town in which the Devil has been cordially invited. Autopsy Bliss sends out the invitation after a particularly discouraging situation at work, and the recipient is found standing near a tree by Autopsy's son, Fielding Bliss. Sal is thirteen-years-old, disheveled, scarcely clothed, and claiming to be the infamous Lucifer himself. When Fielding brings Sal home, there's an initial onslaught of confusion and disarray from the Bliss family and their neighbors. The people who matter welcome Sal with such wide arms, while the majority are immediately wary and unwilling to accept him. Is he merely a child? Or are the ensuing reckless incidents to be blamed on Sal's true nature as Satan? Written in the most stunning and heart-wrenching poetic prose I have EVER experienced in my 30 years on this earth, The Summer that Melted Everything became the storyline to overshadow any other storyline that was happening simultaneously in my current reading life. It was relevant, it was so horribly and wonderfully relevant despite being set 32 years in the past. It was about one thing, and about so many things, at the same time. There were themes of racism, sexual orientation, abuse, acceptance, love, and so, so much hate. Every single theme existed in a deliriously spectacular unison, and Tiffany McDaniel's writing is my new favourite place to exist in. 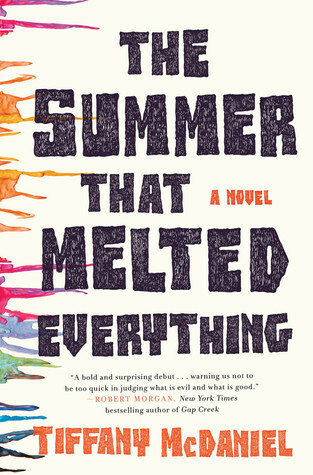 Don't let the vibrant color and design of this novel fool you, The Summer that Melted Everything is not the book to fill your happy, sun-drenched days with, and it is most definitely not the novel to bring you out of the harrowing misery the world could impose on your soul. But if you don't experience the 320 pages of pure poetic misery that THIS novel will hand you, you will be doing yourself a serious injustice. Recommended for Fans of: Literary fiction, Dark themes, Gillian Flynn. providing a print copy of this book for review!